Tuesday’s victories in Virginia and New Jersey had Democratic strategists practically tripping over themselves to predict 2018 good fortunes. Democrats won the governor’s mansion in both states by wide margins. They picked up at least 16 state legislative seats in Virginia. That included a transgender Democrat defeating a longtime conservative Republican state legislator who authored a so-called bathroom bill. And in Maine, voters supported a ballot measure to expand Medicaid. But we already knew Democrats had an enthusiasm advantage. Remember the $30 million Jon Ossoff raised in Georgia? Although they’ve failed to flip any House seats in special elections during President Donald Trump’s presidency, Democrats have been flipping state House races all year, recruiting congressional candidates who haven’t wanted to run in the past, and raising real money. “I would not want to be Barbara Comstock today,” one GOP strategist in Virginia said Wednesday morning. Democrats are targeting four congressional seats in Virginia next year. By the numbers, their best pickup opportunity is the 10th District, where Comstock has been an elusive target. Hillary Clinton won the district by 10 points, while Comstock won a second term by 6 points last fall. Inside Elections with Nathan L. Gonzales rates the race Tilt Republican. Gov.-elect Ralph Northam won the 10th District by an even bigger margin than Clinton, according to calculations from Decision Desk HQ. Comstock is number 6 on Roll Call&apos;s list of the top 10 most vulnerable House members in 2018. Freshman Republican Scott Taylor sits in a race rated Solid Republican. Trump won his district last fall, but Northam — who represented that area — won it Tuesday night, claiming 51 percent of the vote there compared to Clinton’s 45 percent. GOP Rep. Tom Garrett, a freshman in the 5th District, is also a Democratic target. 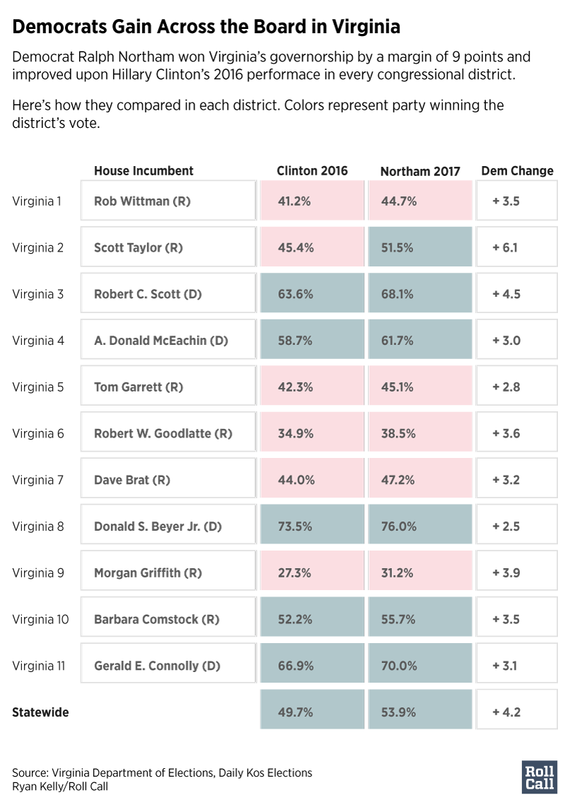 Northam lost that district by a smaller margin than Clinton did last fall, but not by much. Garrett’s race is rated Likely Republican. Northam also lost 7th District Rep. Dave Brat’s seat by a smaller margin than Clinton did. “Brat should be a little more worried today,” the GOP strategist said. History is against Republicans. Traditionally the party out of control of the White House picks up seats in the midterms, and Democratic challengers have already been outraising some GOP incumbents. Some Republicans saw Tuesday’s results as a rejection of Trump — by traditional GOP voters. Republicans have been saying for weeks now that if they don’t pass a tax overhaul this year, they’ll be in serious trouble next year. There are also concerns about more retirements from Republicans whose open seats represent newly competitive districts. New Jersey’s Frank LoBiondo is the latest to announce his intention not to seek re-election. The 12-term Republican had been difficult to knock off given his strong ties to organized labor, but without him in office, the seat moves from Solid to Lean Republican. But that may not matter. Trump bashed Virginia GOP gubernatorial nominee Ed Gillespie in much the same way he bashed Sen. Luther Strange after the Alabama senator’s loss in the special primary election. “Ed Gillespie worked hard but did not embrace me or what I stand for,” Trump tweeted Tuesday night. Gillespie may have adopted some of Trump’s rhetoric, but it’s true the former RNC chairman never fully embraced Trump. That didn’t make a difference — Republicans still lost in places that don’t like Trump. “The Republicans have a huge suburban problem,” the Virginia Republican strategist said. “The variations, as you go down the ballot between what happened at the top of the ticket and what happened at the bottom of the ticket, are tiny,” he added. “Incumbents who are used to running ahead of the top of the ticket were running ahead, but not well ahead,” he said. That was a problem for GOP state legislators and doesn&apos;t bode well for Comstock, who could be running with Corey Stewart on the top of the Virginia ticket in 2018. Democrats will be trying to tie Comstock to Trump, but also to Speaker Paul D. Ryan. The Democratic Congressional Campaign Committee zeroed in on “establishment Republicans” in their statement on Tuesday’s Democratic wins in Virginia. “These results echo what we have seen in every election in 2017: the enthusiasm behind Democrats is absolutely off the charts, and the establishment Republican brand is producing a powerful backlash at the polls,” DCCC spokesman Jacob Peters said. In an early October PPP poll of Virginia’s 10th District conducted for Patriot Majority, a Democratic group, Speaker Paul D. Ryan had a higher disapproval rating than Trump. Meanwhile, Republicans locked in primaries in Trump states immediately concluded Tuesday night they need to be more pro-Trump, with West Virginia Attorney General Patrick Morrisey using the results to take a shot at his Senate primary opponent. No one knows what the national conversation will look like in November 2018. Remember that in the fall of 2013, when the government shutdown looked like it could hurt Republicans in the 2014 midterms, no one could have predicted that Ebola and ISIS would dominate the national conversation 12 months later. Another cautionary note is about not extrapolating too much from just one night or from state-level districts that have far fewer people in them than congressional districts. Only two states, both of which Clinton won, had statewide elections on Tuesday. While Democrats are celebrating Gillespie’s loss as a rejection of a racially tinged campaign message across the country, it’s not clear the rejection of that message in a place like Virginia — which Clinton won by 5 points — says much about how that message plays in redder parts of the country.